UPDATE: Thanks to Jerry for reminding me that it’s an Oglesby and not an Al-Toy. It looks in pretty good shape. 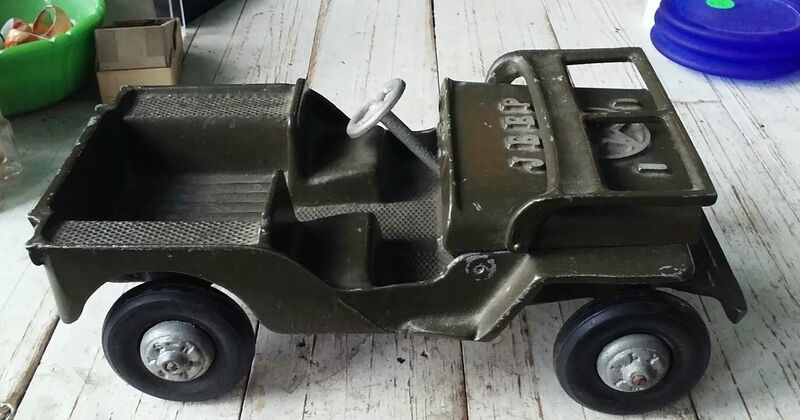 Actually this is an Oglesby Jeep made in Peru Indiana. Very similar to an Al-Toy but has the invasion star cast into, the hood, a cast in place engine and Willys cast into the hub caps. These are very collectible and often accompanied with a trailer complete with a drop down tailgate and matching hub caps. I should have looked at this more carefully. I own an Oglesby, lol. I’ll correct. Thanks! Interesting strategy… might work out.